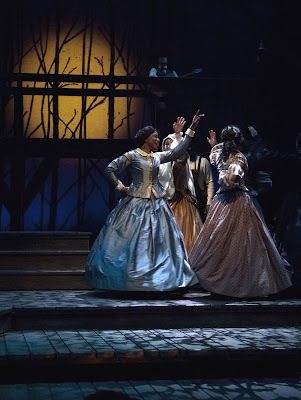 The African-American Shakespeare Company is a serious enterprise that turns out consistently high quality performances of the works of the Bard. But if you would ask the people who came last night to see the premiere of the company's annual run of "Cinderella," they would tell you they love this one most of all. And what's not to love? The evil stepmother and stepsisters are so EVIL! Cinderella is so GORGEOUS! The Fairy Godmother is the grandma we all love to remember and everybody knows what happens when the slipper fits. Good trumps evil. The handsome prince carries his bride away to happy land. But getting there is the best part and they're walking on somewhat different turf than Walt Disney ever did. In this decidedly Afro-centric version of the beloved fairy tale, the sisters are named Zonita and Shaniqua. The tall, skinny Zonita (Martin Grizell) and the shorter, even dumpier (if this is possible) Shaniqua (Abbie Rhone) steal the show every time their size 12s hit the stage. They ramp up the camp without mercy. What Zonita flashes the Prince's pages, when it is her turn to try on the slipper, was definitely not in Walt Disney's playbook. Belinda Sullivan is the most soulful Fairy Godmother ever, and Melvina Hayes is suitably nasty as the stepmother. The men take second fiddle in this story, but Prince Charming (Detroit Dunwood) is charming enough. The man also knows how to pick the right woman, because Delina Brooks gives Cinderella a smile that can melt rocks. The theater is filled with teenagers, and in a very nice way. They have come to see the show even though it isn't a cartoon and it is not dumbed down. Adults laugh as hard the kids. It's impossible not to love this Cinderella. 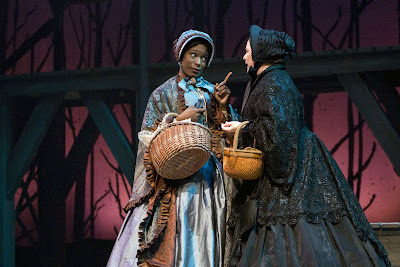 The San Francisco Theater Blog Awards Division awards "Cinderella" Three Stars with Two BANGLES OF PRAISE. 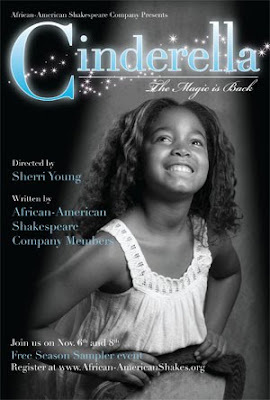 African American Shakespeare has been performing this show for some years now and it's just getting better each year. One BANGLE is for that touching Nat Cole version of "Smile," and the other is for Belinda Sullivan, who not only knows good from evil but is smart enough to keep her granddaughters from fighting with each other...almost. Everybody looks for a show to take the kids to that the parents will enjoy every bit as much as the kids. This is the one. Paula Vogel's "A Civil War Christmas" was written with her 4-year-old niece in mind and during the first act it shows. The playwright wished to present a heartwarming Christmas story set during a difficult time for our country, but rather than use plot and dialog, which might confuse a youngster, the action is done with simplistic narration. 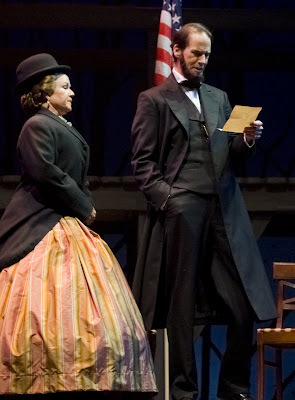 Many new characters are introduced (General Lee, General Grant, Clara Barton, Walt Whitman, President Lincoln and Mrs. Lincoln, Mrs. Lincoln's dressmaker and confidant, etc. ), and each one of them speaks a word or two and then breaks into a piece of a period song. This reviewer was itchy through the first act and but for the courtesy of giving a show the full attention it deserves might have left at intermission. He would have missed the point entirely. In Act Two all the characters begin to tie themselves together, there is a nicely suspenseful search for a lost child, while at the same time John Wilkes Booth is plotting to kidnap the President and Mrs. Lincoln needs to get her Christmas tree back. The finale arrives with great satisfaction, served with a TON of shmaltz, plus some fabulous gospel music. We see that each actor can not only act but some of them can sing their rear ends off. C. Kelly Wright, who was so terrific in Theatreworks' production of Tony Kushner's "Caroline, or Change," steals the show with her lead on the spiritual "Balm in Gilead," and she has been equally strong throughout the play in her twin roles as Mrs. Lincoln's dressmaker Elizabeth Keckley and the runaway slave Mrs. Thomas. Michael A. Shepperd's roles as Decatur Bronson and James Wormley are equally riveting, especially when blacksmith Bronson, whose wife has been kidnapped by retreating Texas Conferedate soldiers, sings "The Yellow Rose of Texas" and ends it with a rap on his anvil that brings the audience to its feet. Period costumes by Fumiko Bielefeldt are particuarly notable, because each character plays multiple roles and many of them are wearing hoop skirts. Sometimes there's no time to get the skirt off when you change from a female to role, so -- just put on a jacket and a hat, as Elizabeth Palmer is seen doing here. 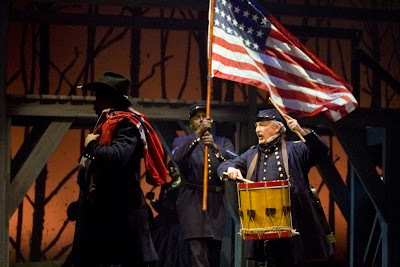 Perhaps the best part of "A Civil War Christmas" is its telling of history from a more African-American perspective. 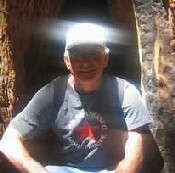 Vogel has done us all a service in filling in a few blanks over which our history books have traditionally glossed. A slave market three blocks from Abe Lincoln's White House? Are you kidding? No. The show has faults, principal of which is the ponderous Act One. But let us not undervalue the power of the "Awwwwww!" The audience gets to expend one after another at the finale, smiling after each one, and hankies are universally produced and used. Everyone exits smiling. Hey, it's Christmas. 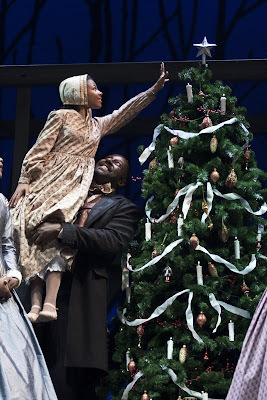 The San Francisco Theater Blog Awards Division awards "A Civil War Christmas" Three Stars with one BANGLE OF PRAISE and one bauble of despair. Act Two is so good, but Act One needs shortening, tightening, and -- what's the opposite of dumbing down, smartening up? -- smartening up the dialog and speeding up the staging. If Act Two pays off so nicely now, imagine how it will impact us once we are sorry Intermission has come? The BANGLE OF PRAISE is for the music. Vogel, along with Musical Director William Liberatore and Arranger Daryl Waters, take us across many lines of American musical history. The black gospel arrangements, especially, bring excitement and power to the production. The bauble of despair perhaps lands, quivering, at the feet of director Robert Kelley, who seems more in love with the playwright's history lessons than he is with motion and entertainment. This may be endemic to a smaller stage at Lucie Stern Theater, or may in fact be already on the page. Either way -- they need to do more with less, rather than less with more. "A Civil War Christmas" feels like it wants to become standard holiday fare. With a little work, it may turn out to be just that. 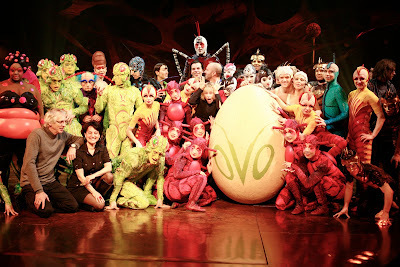 Cirque du Soleil's 'Ovo': ☼ ☼ ☼ ☼ ☼ ! Cirque du Soleil has really done it this time. For this reviewer, Cirque performances over the years have been coming to resemble Las Vegas productions with a muscular Bulgarian on a tightrope filling in for Wayne Newton. You witness astonishing physical feats but you always plod out of the tent searching for the closest slot machine. Take the six red ants. Here you see them precision-juggling spinning trash can lids but they also toss each other all over the stage while either on their backs or standing on their hands. It's indescribable, really -- and that's only the second act. 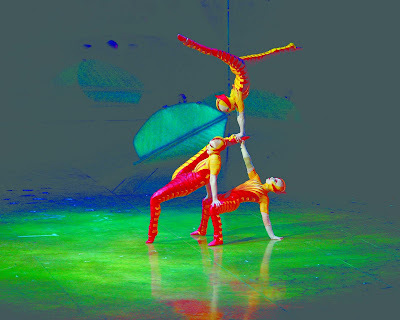 They follow the blue dragonfly, who balances on one muscular arm while contorting himself into impossible positions. And everywhere you look, there are green crickets. The costumes -- you have to wonder about costume designer Liz Vandal. Does she have a thing about sensual bugs? Does she look like this? No, she looks like this. 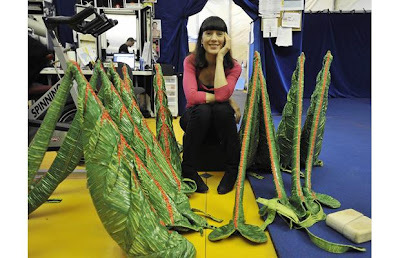 And she has created a world, along with director and writer Deborah Colker, that is nothing short of insect ballet. The performers have the most finely-honed circus skills on the planet, but they never let you forget they are bugs. They move around the stage like bugs. They jump like bugs. 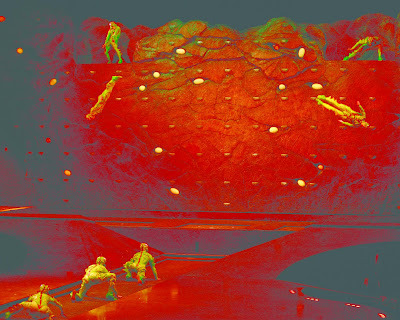 And on the unforgettable Wall act, which is the performance finale to Act Two, there are twenty of them, running, jumping and tumbling on trampolines as they mount and dismount from a 26-foot vertical wall. Sadly, there is no photo of the man-woman rope climbing team who manage a sensual pas-de-ropes while many feet off the ground. And we never did find out what kind of insect this guy is, but he looks like a soldier in the army of Genghiz Khan, even when he's balancing precariously on a slack wire. We cannot imagine a finer Cirque du Soleil. Tickets are not cheap, but they are not unreasonable for such an intensely labor-intensive production. Christmas is here. You might think about motoring up the family cocoon and heading on down to Pac Bell Park. RATINGS: ☼ ☼ ☼ ☼ ☼ ! 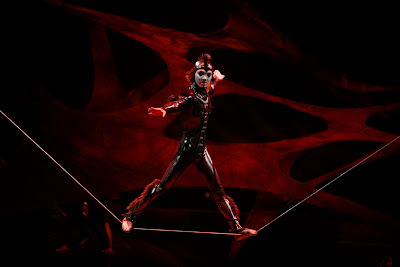 The San Francisco Theater Blog Awards Division awards Cirque du Soleil's "Ovo" its highest possible rating: Five Stars. No, it's not Hamlet, but you will be moved by the grace of the human body and the ingenuity of the entire production team. You will shake your head and wonder: "Did I just see that? How in the world did he do that?" 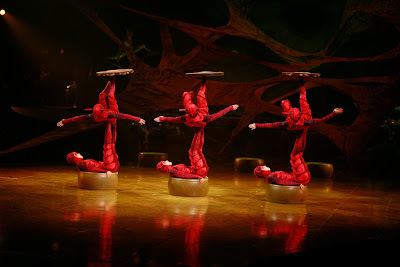 After 25 years, Cirque cannot top itself each year, and recently they have not. This time they did. Take your favorite spider and sit down beside her. We sat behind one and could not see everything, and it didn't really matter in the end, but it would be better to be in the center.